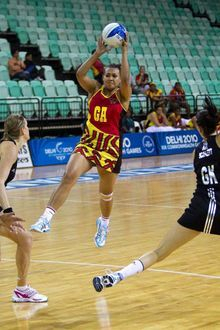 2015 is a significant year for the PNG National Netball Team as PNG plays host to the XV Pacific Games (formerly the South Pacific Games) at which all the Oceania island states assemble for a sporting festival which lasts some sixteen days across a fairly comprehensive selection of team and individual sports. Netball is one of those sports played across Oceania but only six or seven countries have national teams that can competitively contest at a level that can be sanctioned by IFNA. Seven countries will contest for medals at the Pacific Games, Papua New Guinea, Fiji, Samoa, Cook Islands, Tonga, The Solomon Islands and Vanuatu. Each match contested is considered an international fixture and impacts on the countries international rankings as measured by the International Federation of Netball Associations. (IFNA). Up for grabs is a Gold, Silver and Bronze Medal. The PNG Pepe's 2011 program is quite an important one having been marginalised in 2010 by sister Pacific nations, Fiji, Samoa and the Cook Islands. 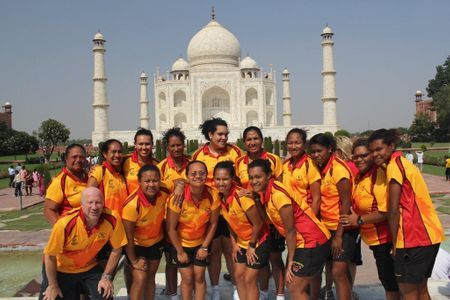 As a result of loses in 2010 at the Pacific Netball Series and at the Delhi Commonwealth Games, PNG's world ranking fell sharply from 12th in the world to 17th as at December 2010. The prognosis however was not as bad as initially made out as both Scotland and Ireland did not fare as well as anticipated at the Nations Cup in Singapore in December 2010 and as such the weighted scores IFNSA set its ranking on last year permits PNG to recover quite a lot of that lost ground with some good international performances. This years Pacific Netball Series which PNG will host will provide the Pepe's with hopefully a home side advantage and hopefully some good results. A team and officials for the 2011 season was announced on the last day of selection trials in Port Moresby this year by Netball PNG. 2010 provided a mixed bag of achievements for the PNG Pepe’s. Wins for the national team were elusive this year despite some agonizingly close finishes, frustrating the Pepe’s aspirations of improving their position in the world rankings. 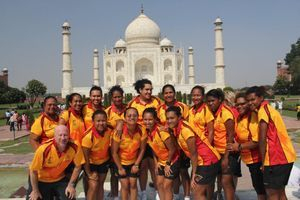 In December 2009, just prior to the announcement that PNG would be invited to play at the Commonwealth Games, PNG was ranked 12th in the world behind Barbados. Since then, PNG’s disappointing results at both the Pacific Netball Series (PNS) in the Cook Islands in June this year and at the Delhi Commonwealth Games, has resulted in the Pepe’s position slipping to 15th in the world. How Scotland and Wales perform at the Nations Cup in Singapore in December this year will further affect PNG’s position on this year’s closing table. Though disappointing, the Pepe’s current predicament does not come from want of trying. PNG’s performances at the PNS in Raratonga this year were outstanding and consistently good. The only element lacking was the finish which, at the end of the day, cost them wins. 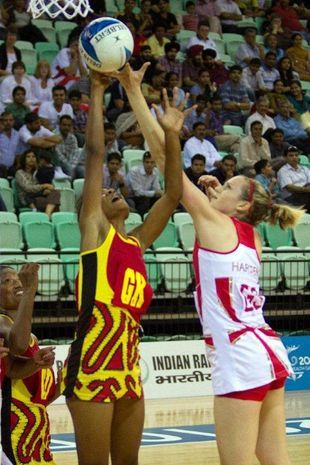 Similarly in Delhi, Barbados 55 - 60 and the Cook Islands 58 – 60 were winnable games and indeed South Africa 46 – 60 was well within reach, but we simply lacked the finish. From the pool PNG was in, New Zealand and England still remain in a class above, humbling the Pepe’s 102 – 21 and 89 – 31, respectively. A comprehensive schedule of results from the Commonwealth Games is available under the “Results and Stats” page option or by simply clicking on the above link. PNG’s lack of international competition against ranked nations outside the Oceania Region continues to be the national team’s Achilles heel and of course financial and logistical limitations always feature highly in PNG’s list of prospect dampeners. It is this aspect that will be an immediate challenge for Netball PNG's (PNGNF's) new executive. The relationship with major sponsor Pacific MMI has been an endearing one for the Pepe’s, with the Insurer carrying the Pepe’s costs again throughout 2010. PMMI has provided critical support for the national team since 2006 committing some K350,000 over the last three years. That relationship continued this year with an official announcement in May 2010 just prior to the Pepes departure for the Cook Islands. PMMI also have the naming rights for the Pepes who are known as the "Pacific MMI Pepes"
Competing at the Delhi Commonwealth Games for the first time in history has to be the highlight of 2010. It rewrote the record books for Netball PNG and provided a rare opportunity for our national team to appreciate the level of competition, the world’s elite perform at. The Pacific Netball Series is always a serious challenge for the Pepe’s considering the amateur stage from which PNG is established, but it is also a serious challenge for the other three nations currently named in the series. Unlike PNG, Fiji, the Cook Islands and Samoa each have the majority of their senior players ensconced in the various tiers of competitions either in Australia or New Zealand and spend very little time in their own countries. The closeness of the Pepe’s campaigns against these countries at the PNS speaks volumes of the tenacity of our national side. Results for this year’s Pacific Netball Series can be found under the Results and Stats page option or by simple following the link. PNG hosts the 2011 series which will bring the best in the Oceania region to Port Moresby in June 2011.